An OCO order is the abbreviation of ”one cancel the other” order. It is used when someone doesn’t have any clues about the possible direction of a currency pair and he/she wants to take advantage of a rapid move. In this case he/she can put an OCO order which is two orders that are waiting to be executed in the platform. If one of them gets filled the other is automatically canceled. 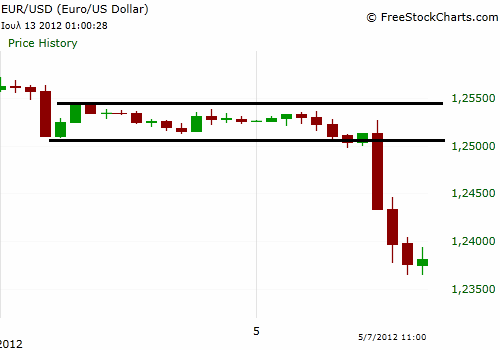 In EUR/USD one hour chart below price is consolidating for a long period of time between a support and a resistance. If someone is unbiased relatively to the direction after the potential breakout, then he/she can put a buy order above resistance i.e. 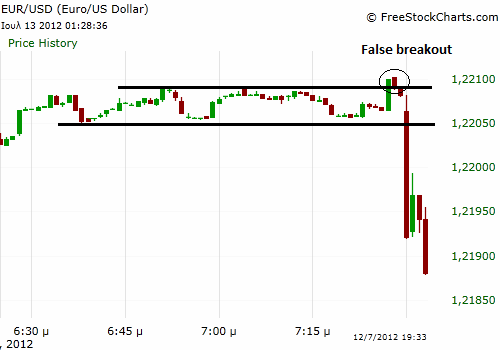 at 1.25510 and a sell order below support i.e. at 1.24990. If any of them executed the other gets cancelled. You can also put stop loss and profit taking orders in the OCO order. The OCO order as promising as it seems to be to a new advocate of the forex markets it is not at all guarantees profits because many times breakouts go at first to one direction in order to reverse to the opposite direction and continue afterwards (EUR/USD 1 minute chart below). In that case the stop loss will be hit and the trader will exit the trade without catching the opposite move if he/she trades in a small time frame.